Despite handing out free burritos last month as part of its ongoing comeback campaign, Chipotle revealed this week that its recovery from the rash of disastrous food-borne illness crises is taking longer than expected, with declining sales pushing the company to predict its first-ever quarterly loss. But on Wednesday, executives at the beleaguered burrito chain said they're considering big plans to lure customers back to its restaurants: more free food. While speaking at a conference with investors, executives at the company said they're looking at plans to increase the number of free burrito giveaways and other promotions, such as buy-one-get-one-free deals, according to a report by Reuters. Specifically, Chipotle said it plans to send 21 million coupons for freebies to US customers in the mail and even more offers via mobile devices. So far, the company has sent as many as 7 million coupons and said 67% of people who received the free burrito coupon last month redeemed it. That's a lot of free burritos. "Free burritos work," Chief Financial Officer Jack Hartung said at the conference, per the report. "They bring people into the restaurant." The potential for ramping up these promotions comes after a regulatory filing from Chipotle on Tuesday revealed both continued declines in sales and higher costs dues to extensive new food safety procedures and marketing campaigns, according to a report by the Chicago Tribune. While sales were slightly up from their worst levels back in January, Chipotle said declines at its established restaurants averaged 26.1% in February and took another hit this month after its Billerica, MA outpost was forced to close due to a Norovirus scare, even though no customers became ill after eating there. 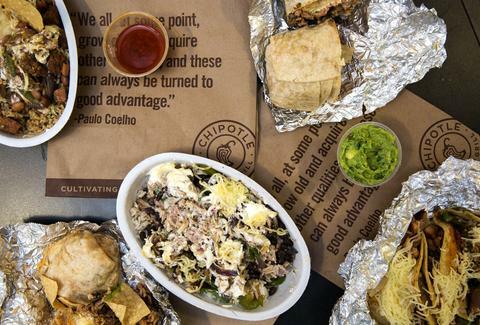 Chipotle stock closed around $500 per share on Wednesday. On top of its efforts to boost sales, Chipotle is continuing its new food safety strategy with the hiring of a food safety czar. On Tuesday, the company named Jim Marsden, a former professor in Kansas State University’s Animal Science and Industry Department, as Executive Director of Food Safety at Chipotle. In the filing, Chipotle said Marsden will spearhead its plan to establish the chain "as a leader in food safety." The new hire comes days after a separate regulatory filing revealed Chipotle's top two executives saw their compensation cut by nearly half last year. While it remains to be seen whether more free burritos will win back enough customers and regain their trust, a free burrito is a free burrito, folks. Tony Merevick is Cities News Editor at Thrillist and fully believes that free food makes everything better. Send news tips to news@thrillist.com and follow him on Twitter @tonymerevick.